Whether he just popped the big question, or you’ve been planning your dream wedding for months, one thing is for certain; once you realize this is “really” it, you also begin to realize there’s a whole lot of planning to do! While we can’t help you pick the perfect dress or decide what flowers your bridesmaids should carry, we’ve been in the limousine business since 2007 and have served hundreds of Northshore brides and grooms so we CAN offer some solid gold tricks of the trade. Here are three from us, to help you while deciding your wedding day transportation needs, and to help make the actual coordination of transportation on the big day stress-free! When most people think of wedding day transportation, they think of a stretch limo or other luxury vehicle whisking the bride and groom off at the end of their day. But the truth is, depending on your wedding and wedding party size, you may have other transportation needs. Is your ceremony taking place at a different venue? If so, you’ll need to transport your wedding party from one location to another. But that doesn’t mean automatically breaking the bank by loading up on limousines. Some brides and grooms dream of being chauffeured away in a luxury vehicle like a Rolls Royce. 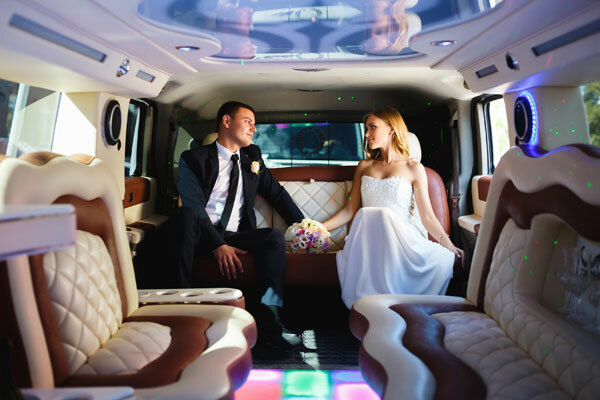 Does your wedding party really need to be driven to the reception in multiple stretch limos, or can they share one that makes repeat trips, share a larger party bus that can accommodate more passengers so only one trip is needed, or even ride in multiple chauffeured SUVs to the party? There are so many ways for us to safely transport you and your guests from Point A to Point B, and we have a wide variety of professional vehicles to do so. Having been in the limousine business on the Northshore for over a decade, we’ve seen our fair share of brides who, for one reason or another, are late to their big day. Whether there was a wardrobe issue, hair that didn’t cooperate with the weather, or some other important detail that wasn’t going off without a hitch, there’s no need to add stress to your big day by arriving to the ceremony late. At Royal Coach Limousines, We Believe in always being at our scheduled location 15 minutes early, so you’ll never have to worry about your transportation showing up late. And we take the extra time and attention to plan the best route based on any weather or traffic issues so they you make it to the ceremony on time. We’ve heard so many heartbreaking horror stories of brides who thought they booked professional, luxury vehicles for their big day, only for the day to arrive and the vehicle that showed up to be in poor condition, not the same color they had selected, or for the vehicle to be very old or outdated. We never want that to happen to you! That’s why We Believe that when you’re choosing your wedding day transportation, you should always schedule a time to see your chosen vehicles in person before the big day so you can make sure they meet, or exceed, your expectations. And if any competitor tells you that viewing the exact vehicle that will be transporting you and your wedding party in advance isn’t an option, that should serve as a huge red flag to you. After all, what are they hiding? Let Us Help You with Your Wedding Day Transportation Needs! Whatever your dream is for your wedding, we want to help you make it a reality. To get the entire inside scoop click the button below to download the full 3 Tips Guide! Contact us or call us today at (985) 875-0723 so we can get started explaining or fleet to you, understanding your transportation needs, and of course, scheduling a time for you to see the exact vehicles you’ve chosen for your big day in advance.